On November 23, 2013, Pham Quy Thi, a Vietnamese farmer, did not expect that his chronic phantom limb pain would be reduced just by concentrating on the movements of his intact hand in a mirror for ten minutes. Mr. Pham had lost his right arm in 1977 because of an exploding cluster bomb and suffered chronic pain in his phantom limb since then. 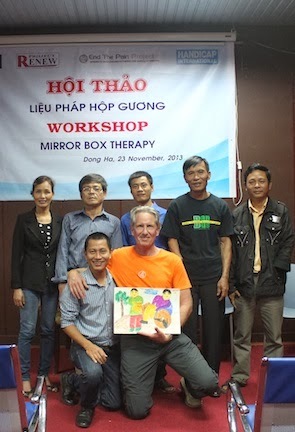 After just ten minutes of using Mirror Therapy, Mr. Pham exclaimed, "This is an amazing therapy! It is my very first time I have the chance to be experienced this and I know it works for me. I surely will bring this home and teach other survivors in my community”. The fifty-eight-year-old was one of four land mine victims being trained by Robert Johnson of Achieve Orthopedic Rehabilitation and an Associate of End The Pain Project, to administer Mirror Therapy in a newly formed Peer-to-Peer program sponsored by Handicap International. The setting for this training workshop was the Mine Action Visitor Center run by Project RENEW in Dong Ha,Vietnam. Mr. Le Kien was gardening in 1991 and struck a hidden cluster bomb. Not only did Mr. Le lose his left leg, he lost his baby daughter at the same time. Now a 55-year-old carpenter, he is a frequent guest speaker and story-teller at mine risk education programs for local school children. In 1986, Hoang Xuan Phuong was tampering with an M14 mine also called a gravel mine in the vicinity of a former U.S. base when it exploded. Mr. Hoang was startled when he clearly 'saw' the mirror image of his lost arm. “It is the very first time, I can really recall my memory about my lost limb after more than twenty five years since the day I was amputated in a landmine blast”. The four volunteers at the Center also raise awareness of the many unexploded mines in Quang Tri Province and promote and advocate for the full application of the rights of persons with disabilities. This group was newly formed by Phu Nguyen Thanh, Facilitator/Support Staff at the Mine Action Visitor Center in August, 2013. Once the quartet have completed their own 30-day mirror therapies, they will go into surrounding communities to help other amputees still suffering phantom limb pain.